The Cardinals have traded Joe Kelly and Allen Craig to the Red Sox for John Lackey, according to Jon Heyman of CBSSports.com. 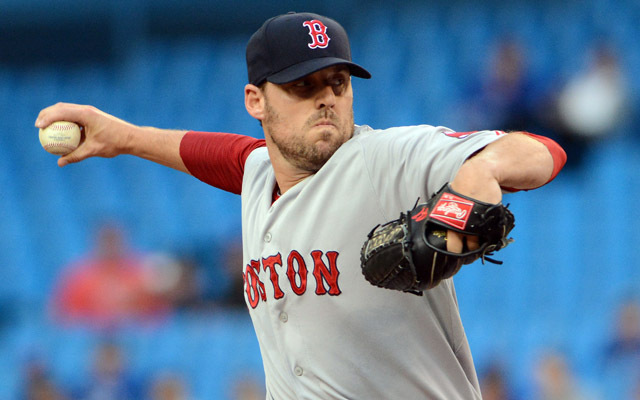 The Cardinals are set to acquire right-hander John Lackey from the Red Sox, reports Jon Heyman of CBSSports.com. Boston will receive right-hander Joe Kelly and outfielder/first baseman Allen Craig in the trade. Lackey, 35, is 11-7 with a 3.60 ERA in 21 starts and 137 1/3 innings this season. He returned from Tommy John surgery last year to go 10-13 with a 3.52 ERA in 189 1/3 innings. Lackey was a key piece of the pitching staff as the Red Sox marched to the 2013 World Series title. Lackey is under contract for only $500,000 next season thanks to a creative vesting option that was triggered by his elbow reconstruction. That dirt cheap year of control raised his trade value greatly. The 26-year-old Kelly is 2-2 with a 4.37 ERA in seven starts and 35 innings this year. He missed a bunch of time with a severe hamstring strain. Kelly is 17-14 with a 3.25 ERA in 38 starts and 30 relief appearances across parts of three MLB seasons. The Cardinals acquired Justin Masterson from the Indians on Wednesday but, obviously, they still had concerns about their rotation due to Shelby Miller's struggles, Michael Wacha's injury and Carlos Martinez's lack of innings. They'll pair Masterson and Lackey with Adam Wainwright, Lance Lynn and Miller for the time being. Craig, 30, is hitting .237/.291/.346 (78 OPS+) with seven home runs in 97 games this season. He will join the just acquired Yoenis Cespedes to reshape Boston's outfield. Craig is a career .291/.343/.460 (120 OPS+) hitter and is owed roughly $27.5 million through 2017. Within the last week or so, the Red Sox have traded four-fifths of their Opening Day rotation in Lackey, Jake Peavy, Jon Lester and Felix Doubront.